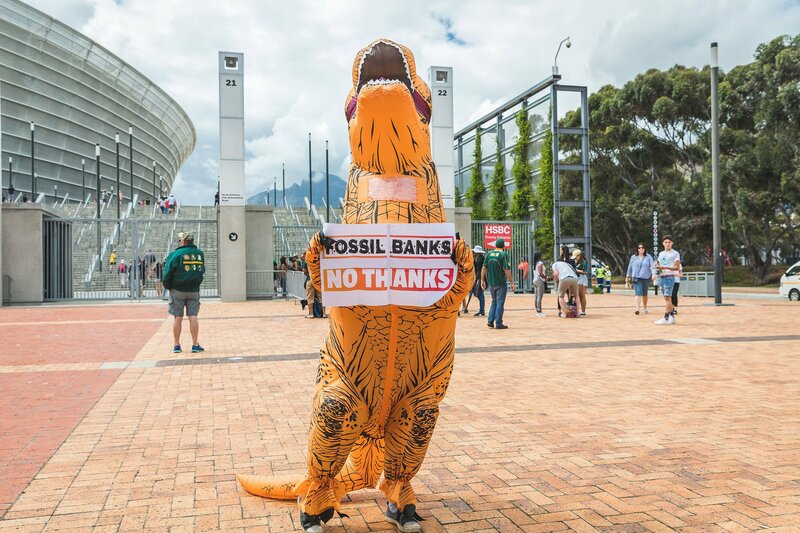 Get Excited — It’s shareholder meeting (AGM to our friends in Europe) season; And this year we’re taking the fight to some of the biggest #FossilBanks and investors on the planet. You may remember a few weeks ago when a coalition of friends (including 198 methods) released a big report showing that global banks have invested $1.9 trillion in fossil fuels. Now, those same banks, and the pipeline companies they finance are holding annual shareholder meetings and we’re ramping up the pressure to demand they #Divest from fossil fuels and climate chaos as part of a Green New Deal. The first events start this week in Seattle and Charlotte (amongst other places) check it out and sign up to join and event near you. OR – if you can’t make it to an event or there isn’t one planned near you right now – click here to chip in $1.98 or more to help us challenge these banks and corporate frackers in front of their shareholders with daring and creative protests. These protests are part of a big, international, coalition that’s working to make the climate crisis a real, immediate concern for big banks and investors. Because to stop a further climate chaos, we urgently need to bring the fossil fuel era to an end. But only massive public pressure will make banks divest from pipelines, fracking wells and other climate-wrecking industries. So we need your help and participation to build that pressure on the Fossil Banks. April 10 – Charlotte NC and all over the Country protesting at Chase and Wells Fargo branches, in particular. Lots more events are being planned – so stay tuned and drop us a line on Facebook, on Twitter, or right here on the good old fashioned website if you have an AGM/Shareholder meeting you want help planning! 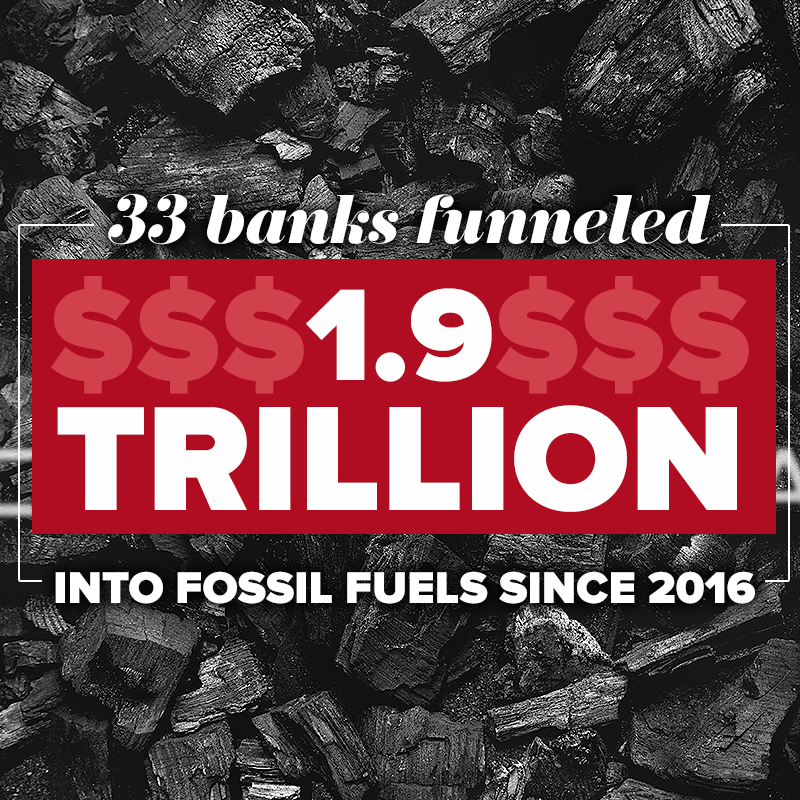 It’ll come as no surprise to regular 198 methods readers and activists that since the Paris climate agreement was signed in late 2015, global banks have invested $1.9 trillion in fossil fuels. About half of it going to companies like Energy Transfer Partners, Transcanada, and others investing in a massive expansion of fossil fuel projects at exactly the moment climate scientists tell us we have 12 years to radically reduce emissions. 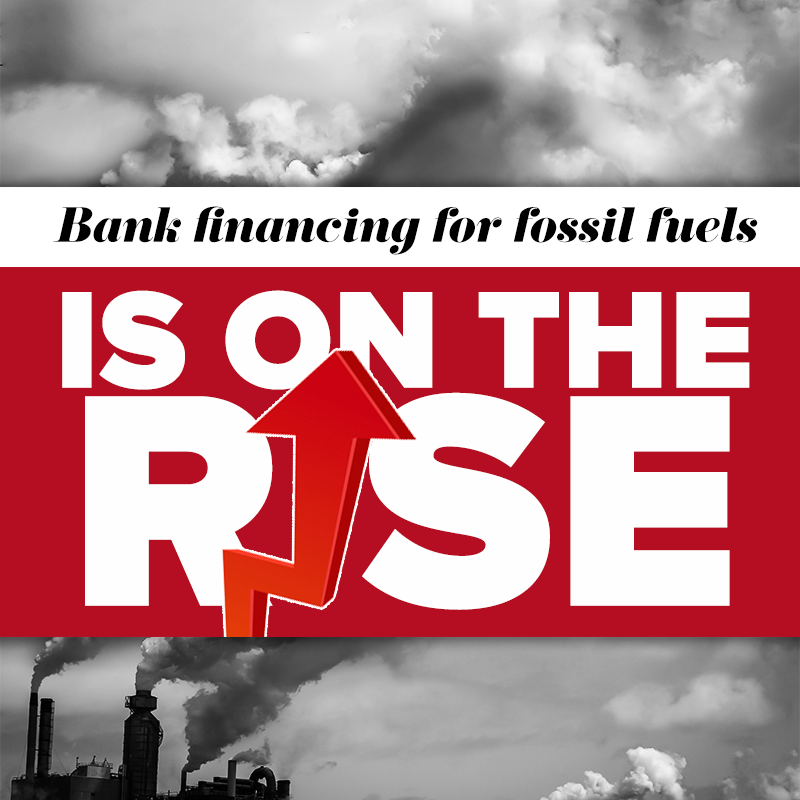 It’s all in the new report Banking on Climate Change: Fossil Fuel Finance Report Card 2019 by Rainforest Action Network, BankTrack, Indigenous Environmental Network, Sierra Club, Oil Change International and Honor the Earth, and endorsed by more than 160 organizations ― including us! Can you help us fight back? 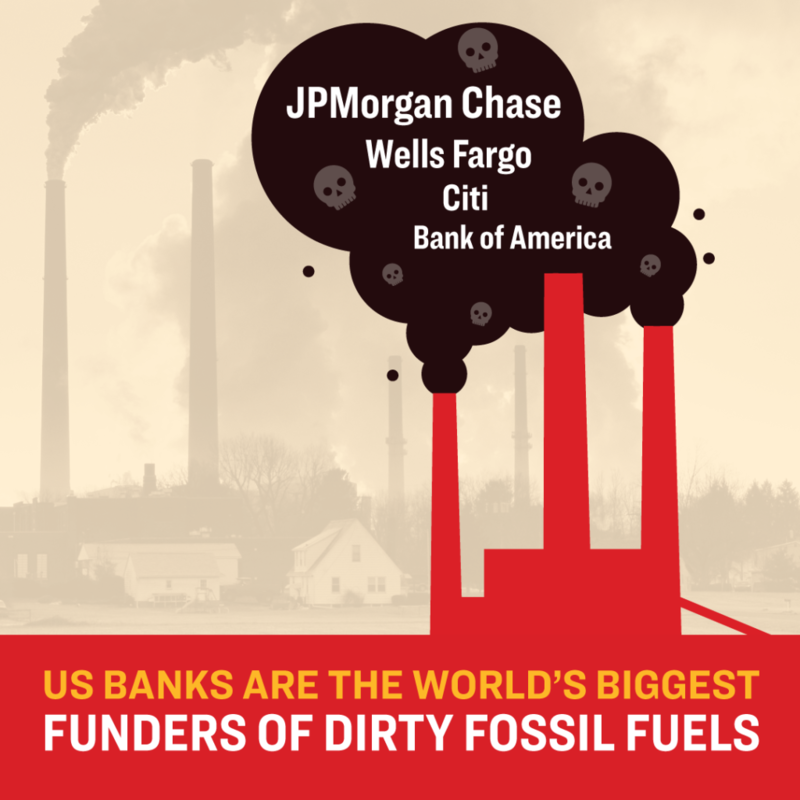 Click here to host or attend one of dozens of protests at local bank branches on April 10 and call out banks dirty investment in climate chaos. In 2015, J.P. Morgan Chase CEO Jamie Dimon supported the Paris Climate agreement and pledged and investment strategy “consistent with a pathway toward low greenhouse gas emissions.” But the report shows he’s been anything but consistent. 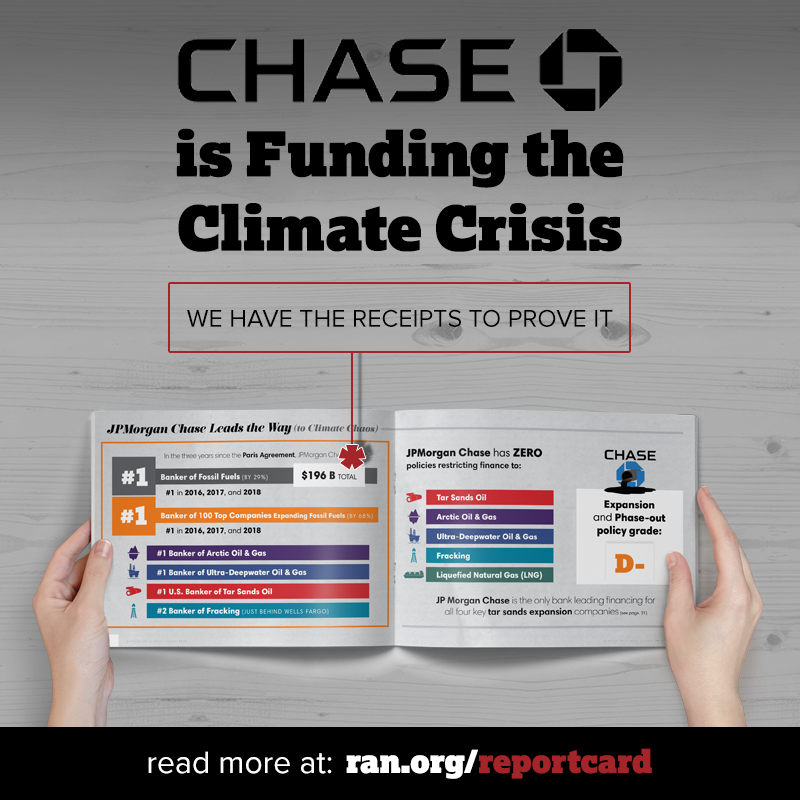 In fact, Chase is the number one bank investing in fossil fuels with $196 billion invested in coal, Arctic oil and gas, fracking, tar sands, and other fossil fuels ― in the last 3 years alone! Lots of European banks like BNP Paribas and ING Bank have taken steps to limit their funding of new fossil fuel projects. But US Banks are continuing to spend $1.9 Trillion on new fossil fuel projects ― and what’s worse, their investment in climate chaos is actually increasing﻿. But if we act together, we can make a difference. The Dakota Access pipeline got $2.5 billion of its $3.8 billion in total funding from banks like Chase and Wells Fargo. Without those loans, they simply wouldn’t have enough money to build new pipelines, coal terminals or fracked gas facilities. Check out the report and share it with your friends online. You can share it on Facebook, on Twitter, or email this page to your friends.